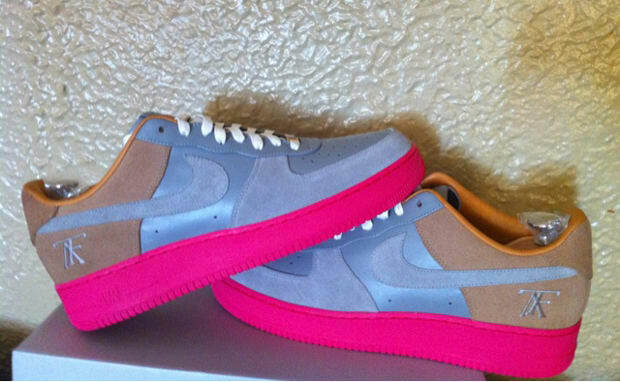 All Day Nike Air Force 1 Bespoke "Jasper"
Two pairs of Bespokes in one day, a present to all sneaker lovers out there. ATF member &apos;All Day&apos; goes with a Kanye-inspired hot pink sole and mixes suede and leather for a colorway of grey, silver and tan for a truly one-of-a-kind (if unsubtle) bespoke — and of course he didn&apos;t forget the ATF logo on the outer heel. Now the real question of the day is which do you like better, All Day&apos;s or Marcus Troy x Maverick&apos;s?